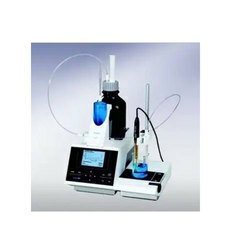 After understanding the specific requirements of our clients, we are into presenting Karl Fischer Titrator. Volumetric titrator for high water contents and coulometer for low water contents for basic applications. These robust instruments offer excellent value for money. - Configuring multiple titration stations with an automatic sample changer. KARL FISCHER TIRATION is a classic titration method in analytical chemistry that uses coulometric or volumetric titration to determine trace amounts of water in a sample. It was invented in 1935 by the German chemist Karl Fischer. 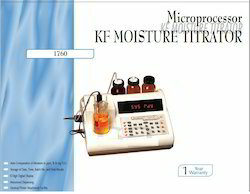 Auto KF Titrator. Cat#: CL510. For Moisture Detection. Cat#: CL530. Burette-less, Digital Model. Karl Fischer titration is a classic titration method in analytical chemistry that uses coulometric or volumetric titration to determine trace amounts of water in a sample.